There is a kind of friction when truth rubs against lies. It can take its time sanding away a life or rip it apart in an instant, but rasp it does. In Tennessee Williams’ masterpiece Cat on a Hot Tin Roof, six members of a Southern cotton plantation family take a good long look at mendacity and try to find peace with their thwarted desires. Some characters shatter lies to seek control, and others hold tight to the lies they must tell themselves. In this production by Middlebury Actors Workshop, a fine cast reveals the depth of Williams’ characters. Big Daddy is celebrating his 65th birthday sitting on a vast estate without a will — which may be fine, since he’s just gotten the news that he’s not, as feared, dying of cancer. His younger — and favorite — son, Brick, prefers drinking to dying. But that’s as close to living as he’s willing to go, now that he’s mourning the suicide of a best friend he loved a great deal more than he does his wife, Maggie. Maggie (the “Cat”) is still sexually attracted to Brick, but they’re no longer sleeping together and so can’t provide the grandchild Big Daddy would adore. Maggie has the strength to fight for the inheritance, but elder son Gooper, an attorney, is disciplined, temperate and about to have his sixth child. His wife, Mae, is even keener on pressing their advantage, and uses her kids like obnoxious pawns to snare the attention of Big Daddy and his wife. Big Mama would prefer Big Daddy’s attentions turn back to her; she’s loved him for 40 years while he’s barely tolerated her. Character is plot in this play, because these six people are all driven by needs they cannot satisfy. Williams refuses to give these realistic figures unrealistic opportunities to fix their lives. It’s tragedy he is after, and the deepest source of that is personality itself. Williams’ courage as a playwright requires equal daring from actors. In MAW’s production, each performer has transcendent moments that reveal the intensity of this magnificent play. As Maggie, Katie Hartke has the energy and determination to bring this complex creature to life. What Maggie wants can be condemned as manipulative and selfish. But who Maggie is earns our fascination. Her dissatisfaction and edge of cruelty are the most accessible elements of the role, yet Hartke goes beyond them to show us the beauty of Maggie’s animal passion for survival. Charlie Murphy plays Brick with a restless despair. It’s a difficult and, arguably, underwritten role. Brick’s needs are clear enough, but his self-deception has all the subtlety of a mist settling on the Mississippi. With few lines and fewer actions, the character must take shape as much in our imagination as before our eyes. Murphy has the brooding down, but Brick’s tragic ease with his own dissipation eludes him. Still, Murphy’s sad, hollow stares are perfectly poignant. 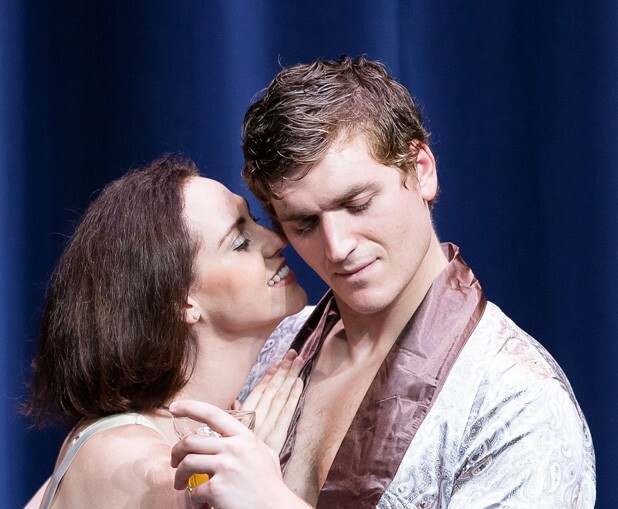 In the show’s only real false note, director Melissa Lourie equates constant, busy attention to the physical gestures of drinking with a portrayal of alcoholism. Instead of showing Brick’s need, she stages his consumption, hyperbolically getting him to down a fifth of whisky in 20 minutes. The effect would be comical if Murphy weren’t able to portray the weight of Brick’s sorrow. Even so, the constant booze pouring undercuts William’s depiction of the refined little alcoholic world Brick perfects in his search for the “click” when his brain shuts off the world. With less casual repetition, the alcoholic’s ritual would mean more, for Williams is trying to show something a lot more profound than a bad habit. Both Hartke and Murphy bring solid ideas to their roles. In Act One, they need to work together to help the audience pierce Brick’s passivity to see his internal turmoil, and go past Maggie’s voluble chatter and preening to understand her anger and anxiety. With Brick nearly silent and Maggie a volcano of words, it’s a challenge. In this production, the actors stay on their private trajectories, so that Maggie’s tactical interest in sleeping with Brick comes through more clearly than her sexual desire. And Brick’s withdrawal is so complete, we don’t see enough of what Maggie, Big Daddy and Big Mama still love about him, his beauty and potential. But as the other characters are introduced, the production gathers intensity. Big Daddy, played by Steve Small, is a powerhouse. Once he’s told his medical fears are unfounded, Big Daddy gives booming voice to the expansive lust for life that his son fails to feel. In a meditation on mortality and morality, Small is charismatic. And when he confronts Brick in what may be the ultimate father-son chat, both actors are superb. Brick is not prepared to admit to himself what he feels for his dead friend Skipper. Big Daddy and Brick must bluster, lie and skirt the edges of the burning shame that homosexuality could provoke in the 1950s, yet Williams’ scene is as powerful, courageous and revelatory as theater gets. Murphy and Small are riveting in that searing duet. As Big Mama, Stephanie Gallas enters as a bundle of nervous motion and then settles into a nuanced portrayal of a woman trying to make do with a husband who can’t be bothered to notice her, despite her embarrassing attempts to rouse his jealousy or, still more futilely, his affection. Joe Schine lets Gooper blandly endure his father’s indifference and his wife’s frantic prodding. It’s not until the end that Gooper emerges from the shadows, and Schine does a clever job of letting us underestimate the well-behaved son. He peels back only a little of the hurt of never having felt an ounce of love from his father, but he makes it count. Tanya Lehman finds all of Mae’s vivid zeal for securing the biggest slice of any pie being handed out. From her first entrance, her showboating pride in her pregnancy radiates through the room. Mae and Gooper are like two baseball players about to crash into each other while chasing a fly ball that neither will catch. Lehman’s Mae, always looking up, can’t bring herself to look out. Lourie’s direction results in strong performances. The set design by Jon Craine places ambiguous entrances all around the room, and the stylization generally works as Lourie shows how the most intimate moments can be overheard or intruded on. Cat on a Hot Tin Roof won the 1955 Pulitzer for best play, and it remains a compelling theatrical experience and a showcase for powerful acting. In one of his textual notes on the work, Williams writes, “Some mystery should be left in the revelation of character in a play, just as a great deal of mystery is always left in the revelation of character in life, even in one’s own character to himself.” This production preserves that mystery, even as the little friction of lies rubs the characters raw. The original print version of this article was headlined "Hot and Bothered"